This article is the first of the series of articles that will help you to learn how to use built-in email system to take your performance to the next level. When you run the application for the first time, you may need to your own outgoing account, that is, the email account you will use to send emails to your clients or colleagues. Please note that you can use different global company email accounts for all your outgoing emails, instead of your own personal one, but this will be covered in the next article. 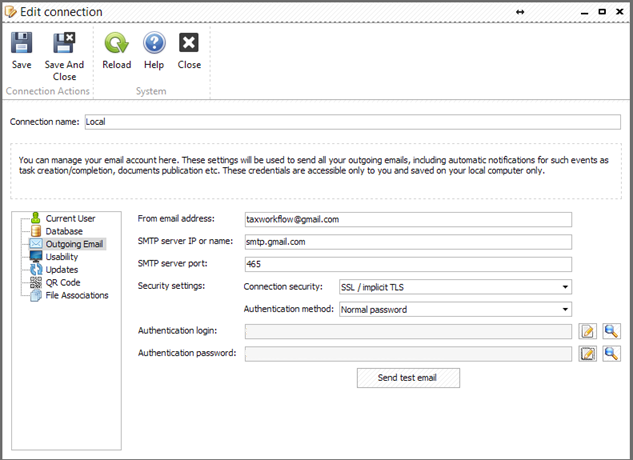 Below we will describe the setup of your personal outgoing email account. The personal email account is used by the application for sending your emails, including emails to clients, emails based on templates, notifications, invoices etc. 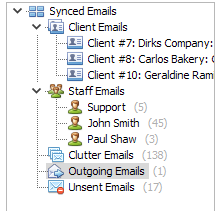 To setup personal outgoing email account click “File” >> “Connection settings…” and select “Outgoing Email” tab in the “Edit Connection” window. If you are using a common post servers such as Gmail, AOL, etc. you can find the values to put in the fields listed above on your post server’s settings pages. Please refer to your email provider for these settings, or email us for help setting up your account if you experience issues with a certain mailbox. To make sure everything works press “Send test email” button, enter an email where you want to send a test message, press “OK” and check the email for test message. Please note that personal outgoing email account should be setup separately on each computer that you are using. Its settings are not stored in the database so each new installation, unlike the global outgoing accounts, so it will require a new setup every time you install TaxWorkFlow on a new computer. If for some reason your outgoing emails cannot be sent they will appear in the “Outgoing Emails” folder first. The system will try to re-send these messages during an hour and if all attempts are failed the messages will be moved to “Unsent Emails” folder. From here the system will try to send messages automatically each hour. To fix this issue click “outgoing email settings” link and enter a new password in the “Authentication password” field of “Edit connection” window. You can find detailed information about all the features in TaxWorkFlow’s online help or by clicking a Help button inside the application.